Your mat production item is superb, and will gain you an immediate medal once I can translate it into a "How to" article for you. not a bad start to your naval career with us. May you sail always with a fair wind and a willing enemy. You are heading for an upgrade in your medal when this is completed. Your town and coastline follows quite close to my modular system. Yes it does expand exponentially. 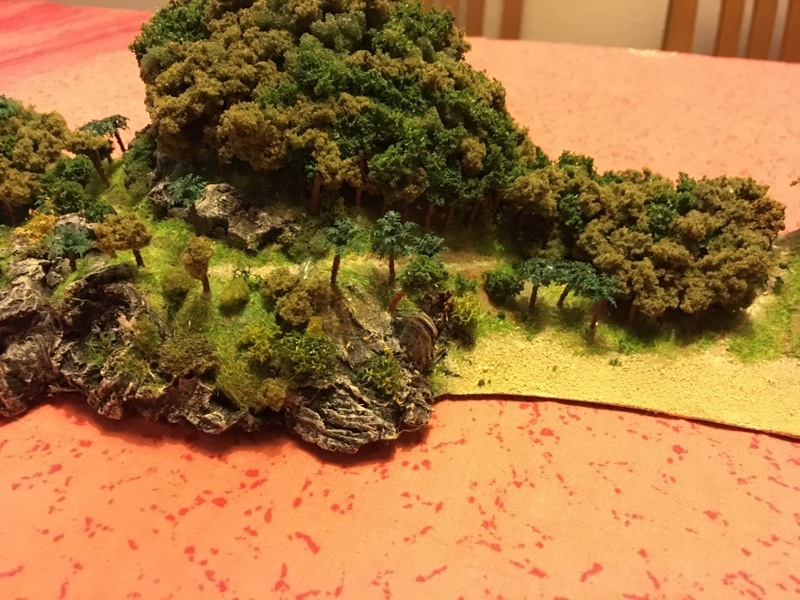 I started copying the Ares coastline using it as a template but soon added bays, peninsulas forts islands and a Harbour. Next came the Egyptian coast for the Nile battle. Valdivia for the Chilean campaign, and I suddenly found I had three boxes of the stuff. Carry on the good work and do have a look at Brigade Models and also Langton's for ideas if nothing else. Brigade can be smaller but I use them for buildings in the distance. Ahoi everybody. 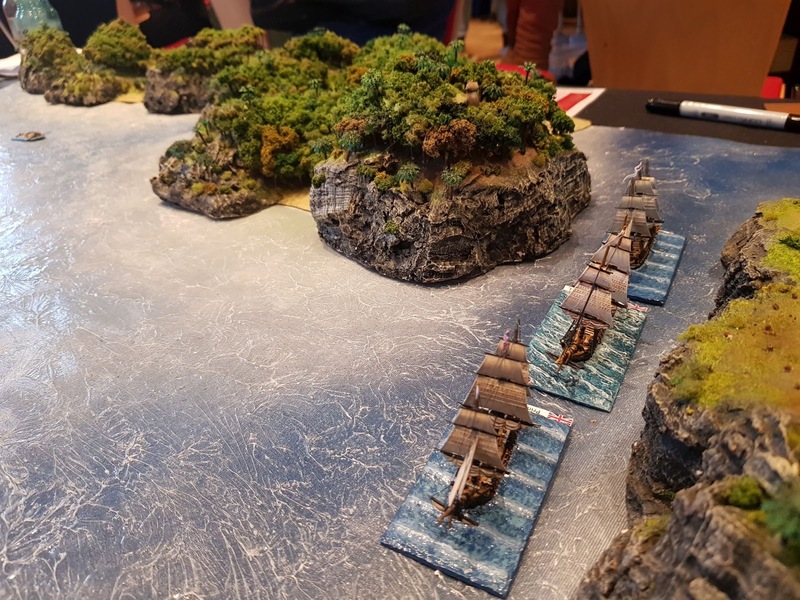 I'm new to this Forum but not so new to naval wargaming. We used different rulesets throughout the last years but none was really satisfying in the end. 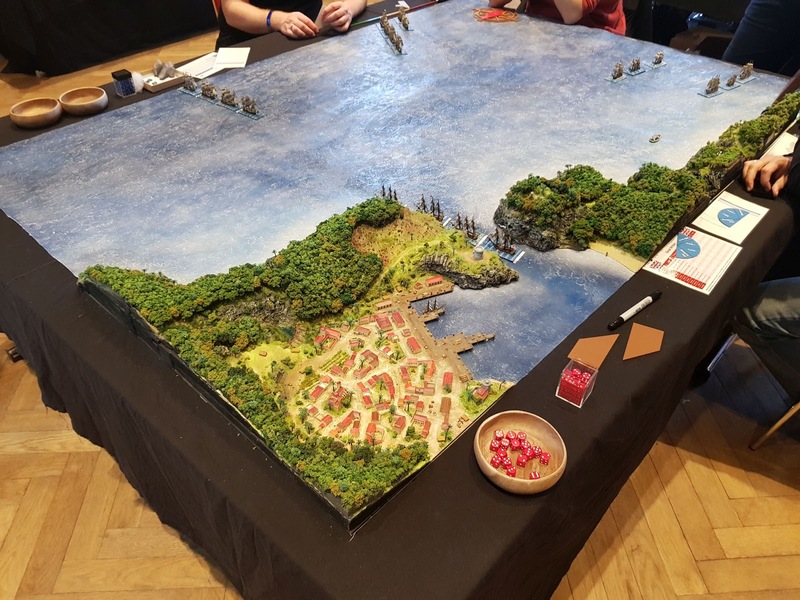 For our demo table for the Hamburger Tactica (biggest convention for historical wargaming) we wanted to depict part of the Caribbean island St. Lucia and a big portion of the surrounding seascape. 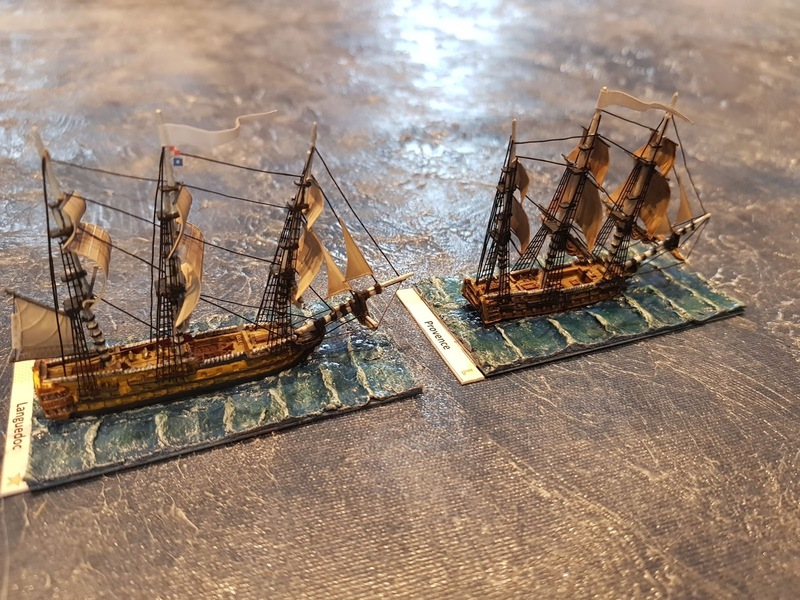 This historical battle was fought between French and British vessels as part of a landing operation during the American war of Independence, when the French fought side by side with the American forces to get their own benefit of this conflict. 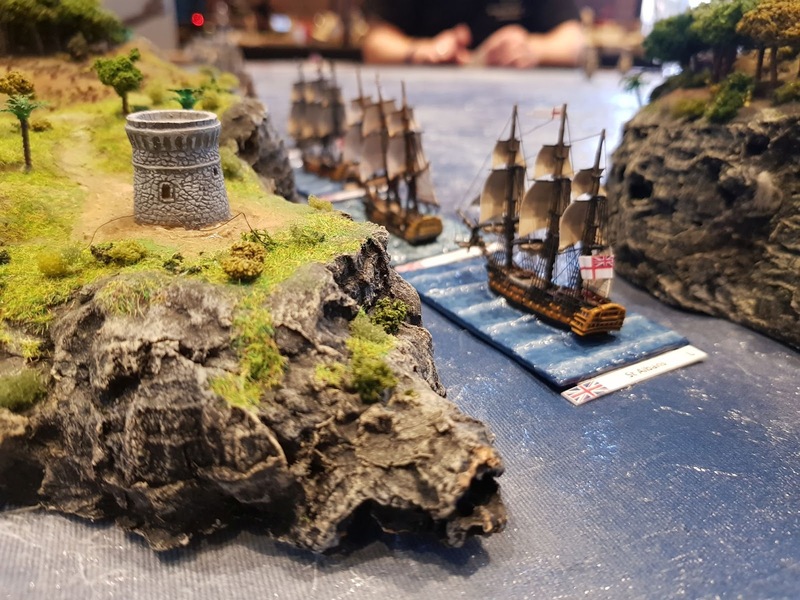 The ships we use are from Langton Miniatures Napoleonic Range. Before we start I first want to share some practical thoughts I had, before I started. 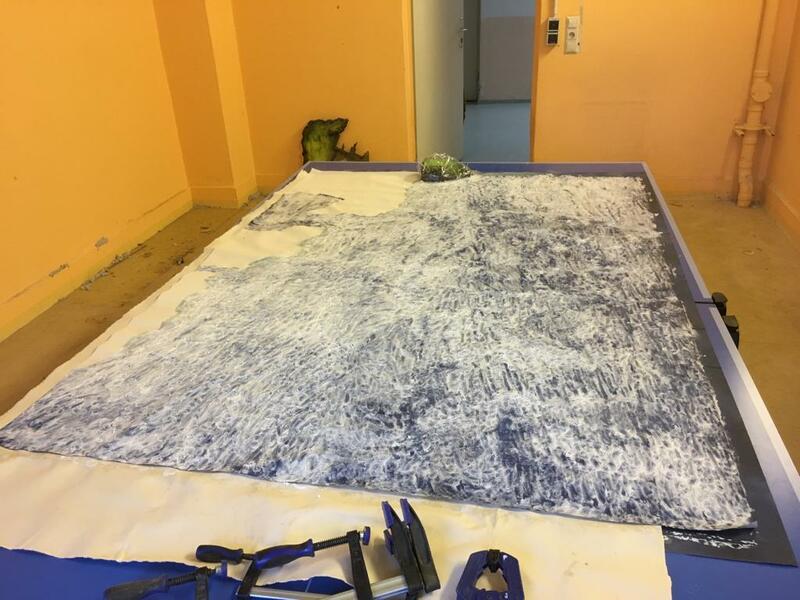 I wanted the whole surface to be of one piece without any seems. 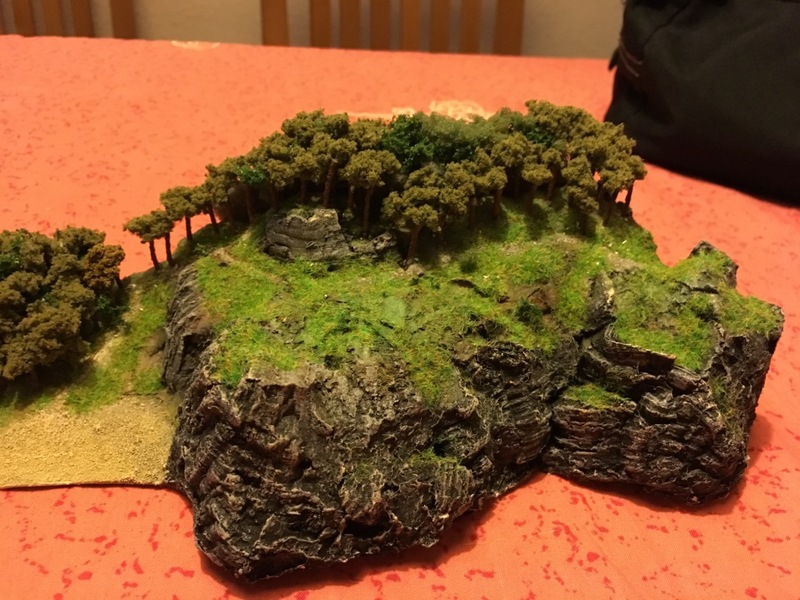 So I couldn’t go for the common 120cmx60cm boards I usually use for my tabletop boards. I shortly tinkered with the idea to use a giant board of Plexiglas, ideally already textured like the sea. The boards usually used for shower cubicle came to my mind. After some internet research I soon realized that a Plexiglas board that big, would cost way too much and it would be a horror to handle a board that big. 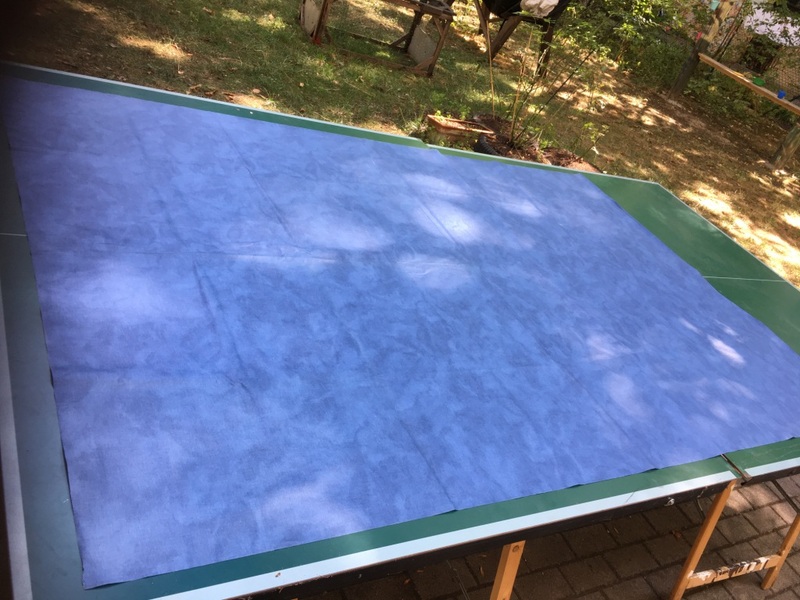 So I decided to build a mat. First I had to find a underlying fabric, ideally blue. 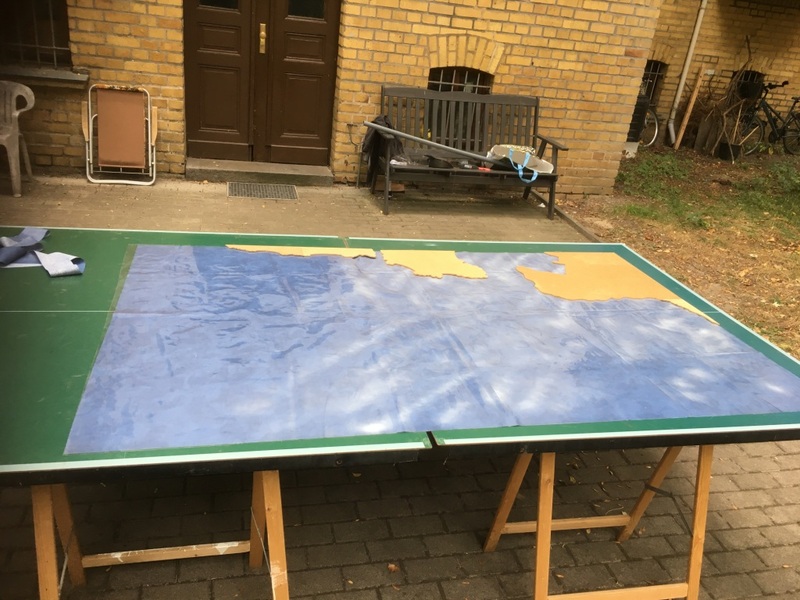 I still had an old tablecloth in my wardrobe so I started my first trials on our table tennis table. 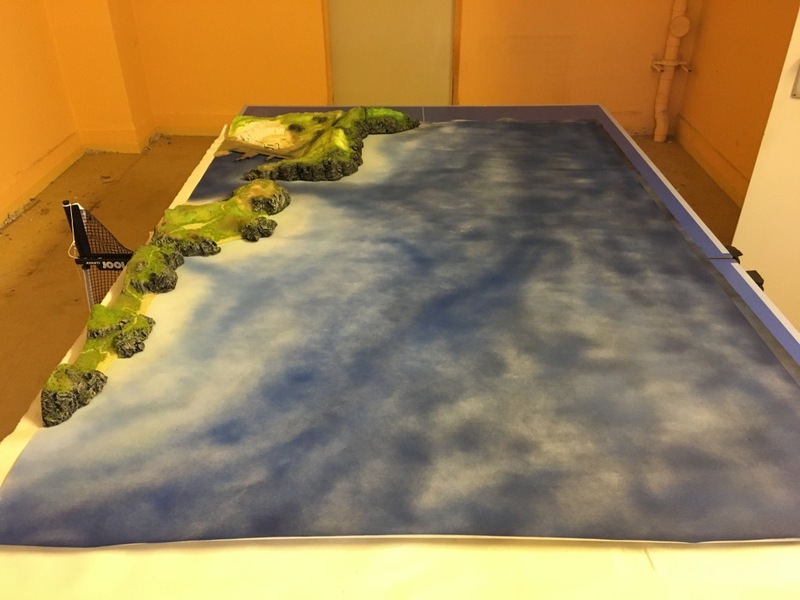 I also put the mdf boards I wanted to use for the coastline on the cloth. 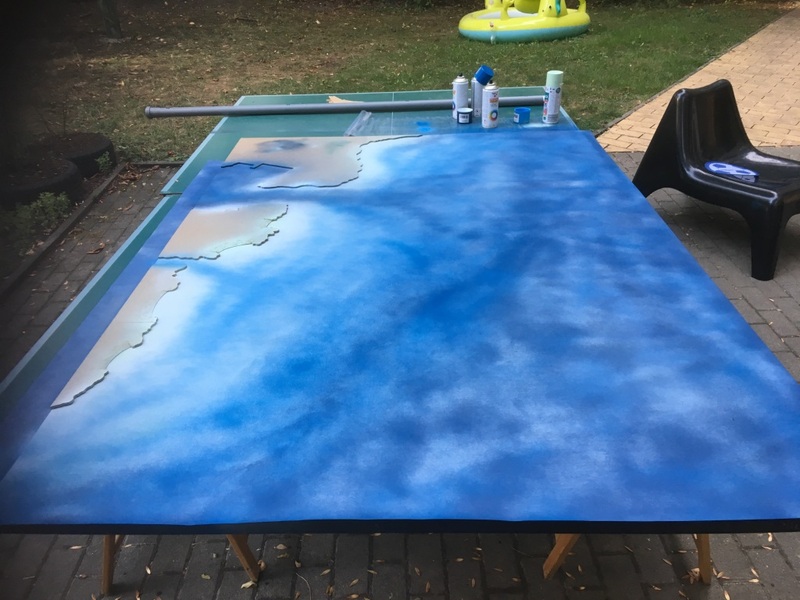 My first idea for depicting the water texture was to use a transparent plastic tablecloth and apply it to the surface with a flat iron. The plastic should partly melt together with the cloth and afterwards I wanted to carve the wave structure into the plastic with a hot air gun. 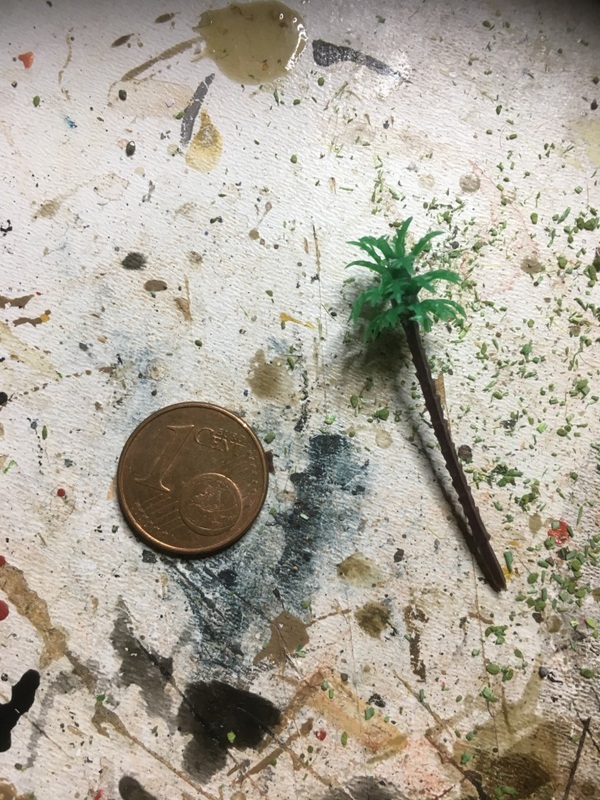 So I decided to go with the old acryl mat technique I already used years ago on a desert mat, just this time with transparent acryl. 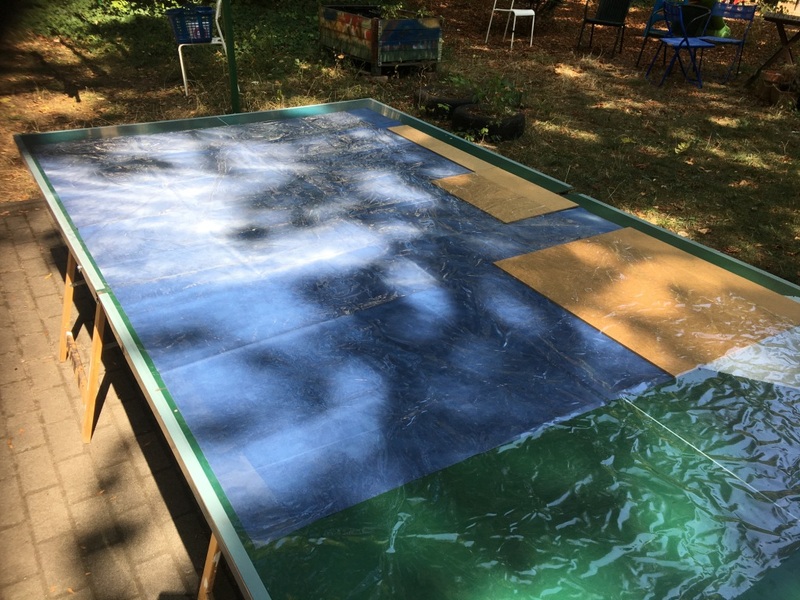 I spray painted the cloth with different shades of blue and white. After this step I realized for the first time, that the wrinkles in the cloth, which came of years of lying folded in my wardrobe, where very sturdy. 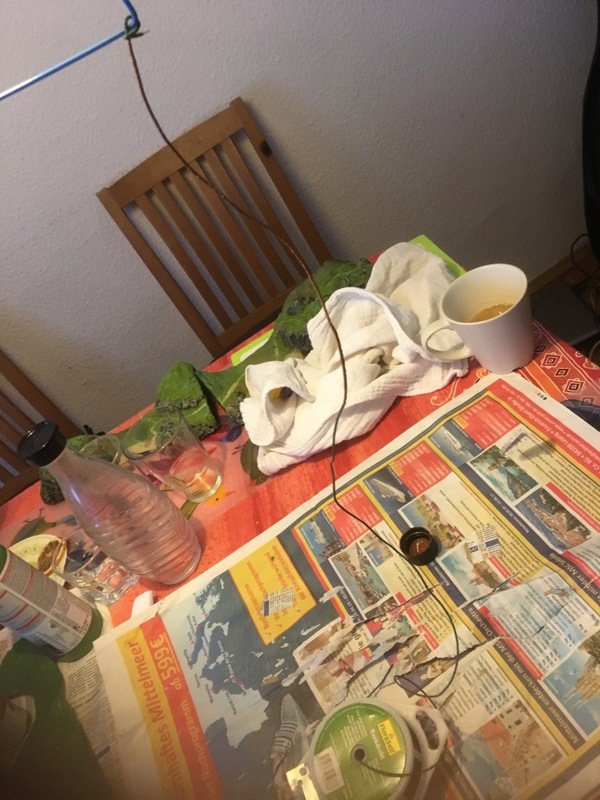 I hoped that they went away after laying flat for some days, but after a week the wrinkles were still there. My attempts with the flat iron didn’t help much. I had to find a way to get rid of the wrinkles. Finally the only thing coming to my mind was to buy a new tablecloth. 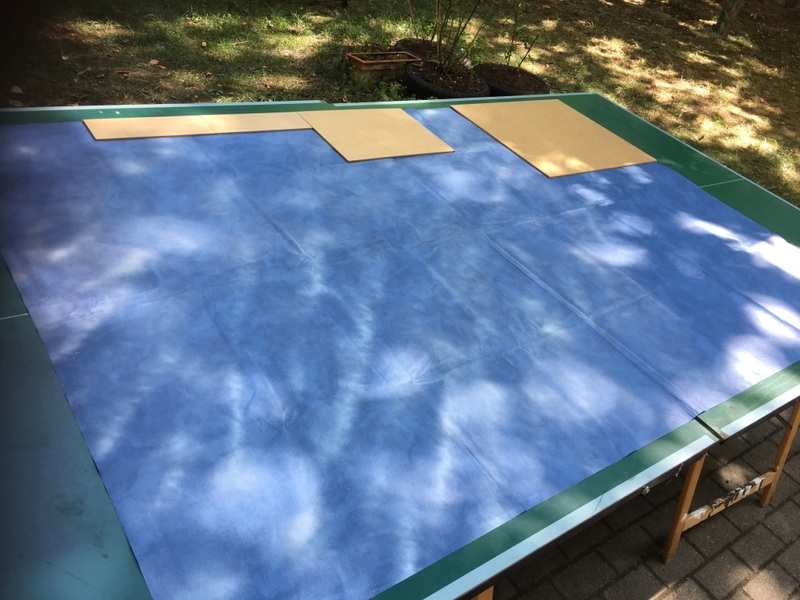 After a short tour through the neighbouring carpet stores I found exactly what I needed: a white tablecloth with no structure and no sealing, as this would have prevented the acryl to stick to the material. 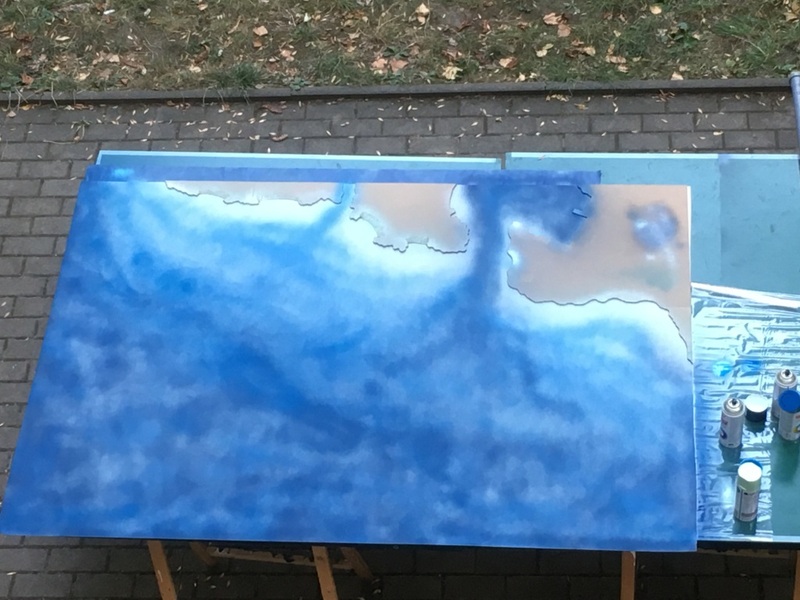 After one more session with the spray cans I was happy with the result: a flat surface with several shades of blue and no wrinkles. A long way I had come, but there was still a longer way in front of me. 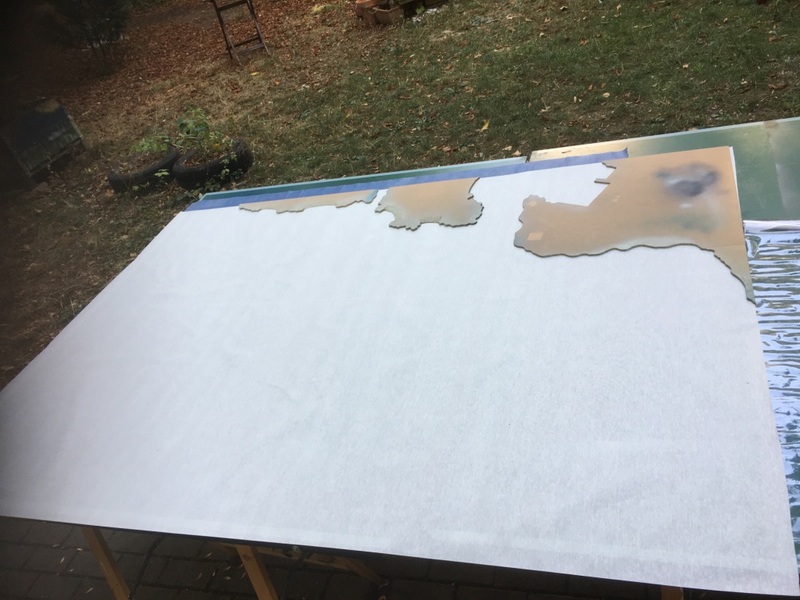 The next step of applying the transparent acryl required me to go indoor, as I didn’t want any outdoory things landing on my drying acryl and thereby being sealed in the water surface forever. It was fall, so lot’s of outdoory things were floating around through the air. Meanwhile the coastline was more elaborate – you’ll see in my next post. 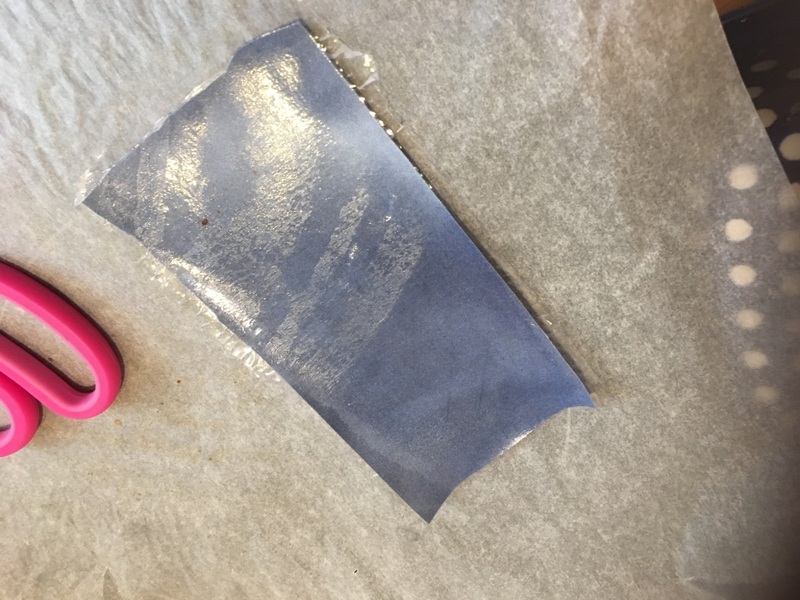 The transparent acryl was applied on the cloth. With a big round brush I dabbed the still wet acryl and achieved a nice wave structure. I had to be very careful not to strike the brush, as the strokes could be seen clearly in the acryl gel. But my sorrows were causeless. The acryl dried out perfectly transparent. 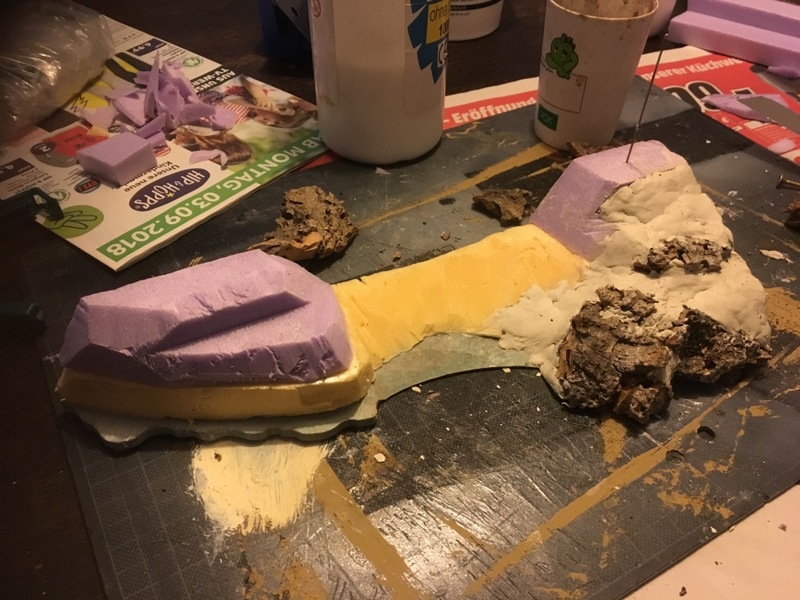 The only thing I had to do was to highlight the waves by drybrushing them white. The result was pleasing enough for me. The bulge you can see one the picture finally settled, as the piece lay flat for a few days. More pictures coming soon, as well as a description of how I built the shoreline. 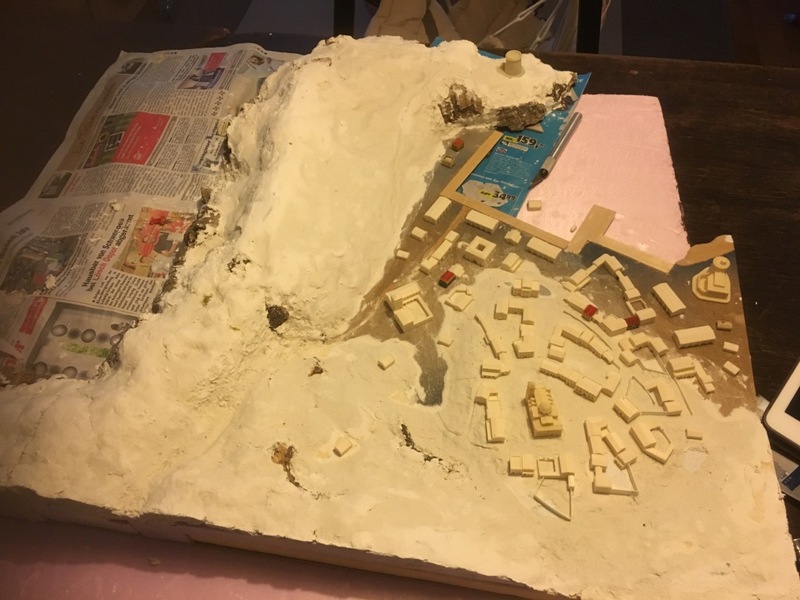 As you can see in the previous post the whole building process of the coastline happened at the same time as the water surface. 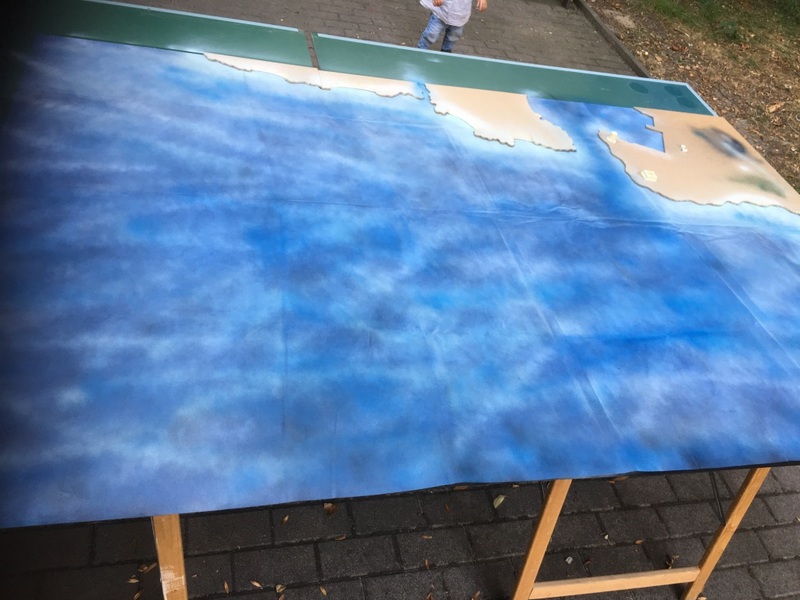 The base for the landmass was cut out of 5mm MDF with a jigsaw. 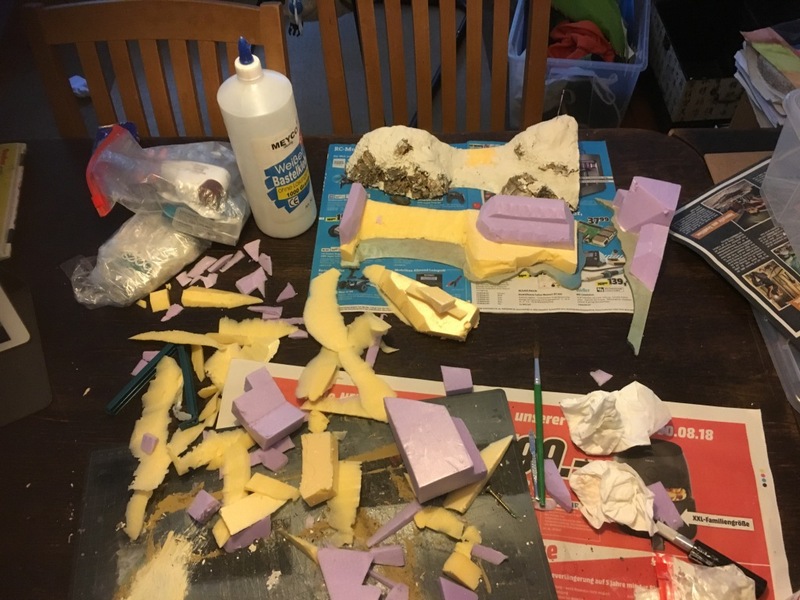 On the base I glued some scrap polystyrene I had left over from other projects. That’s the reason why some of it is yellow, some pink. 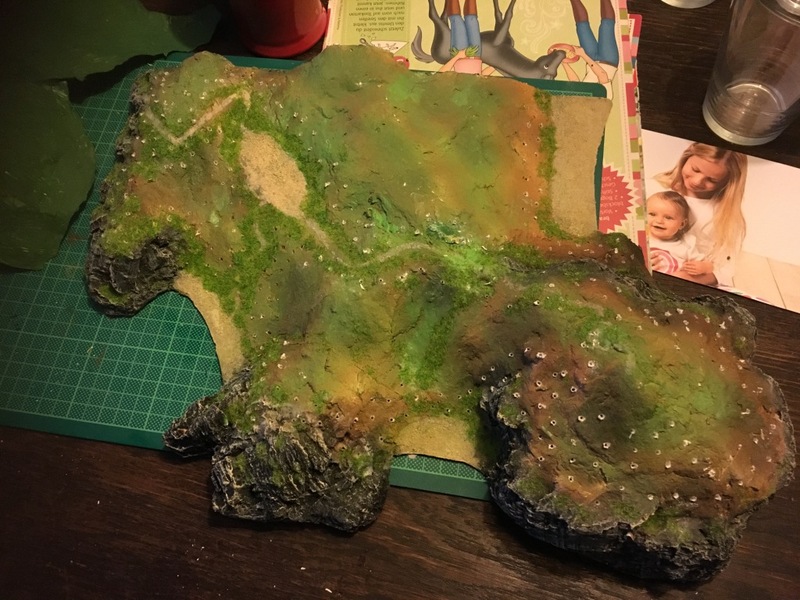 Where the sandy beaches should be I cut a gentle slope in the mdf board. 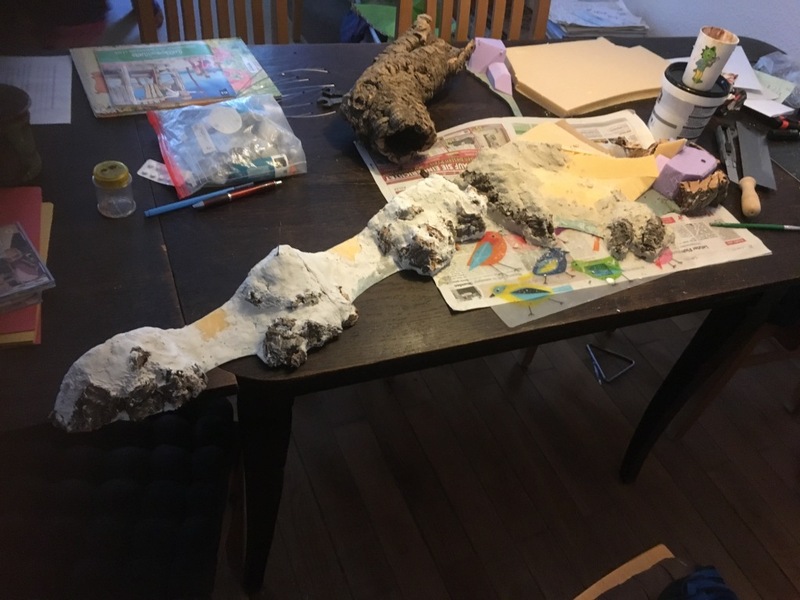 The rocky parts of the coastline where constructed of cork bark, glued into place with a hot glue gun. 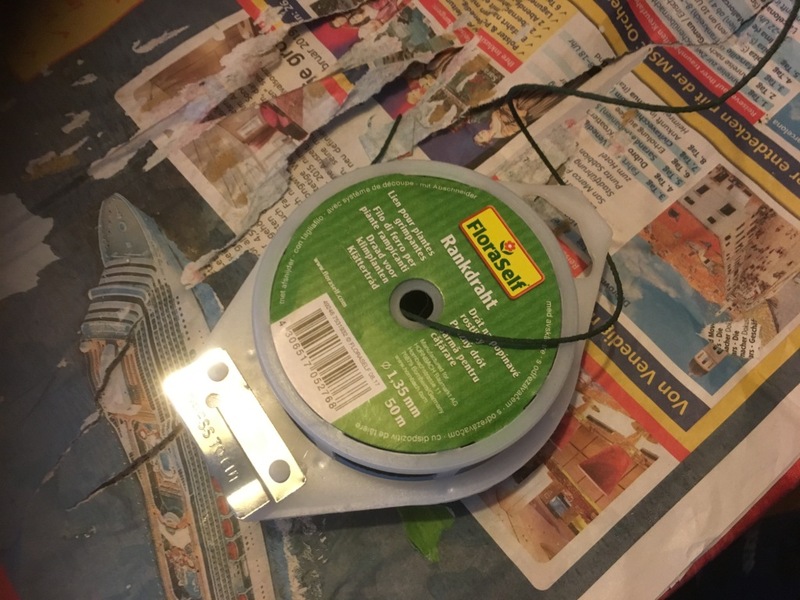 The gaps between the cork and the polystyrene was covered with a sort of papier maché mass (something like a woodfiller, hard to describe) I bought a few months ago in a hobby store. 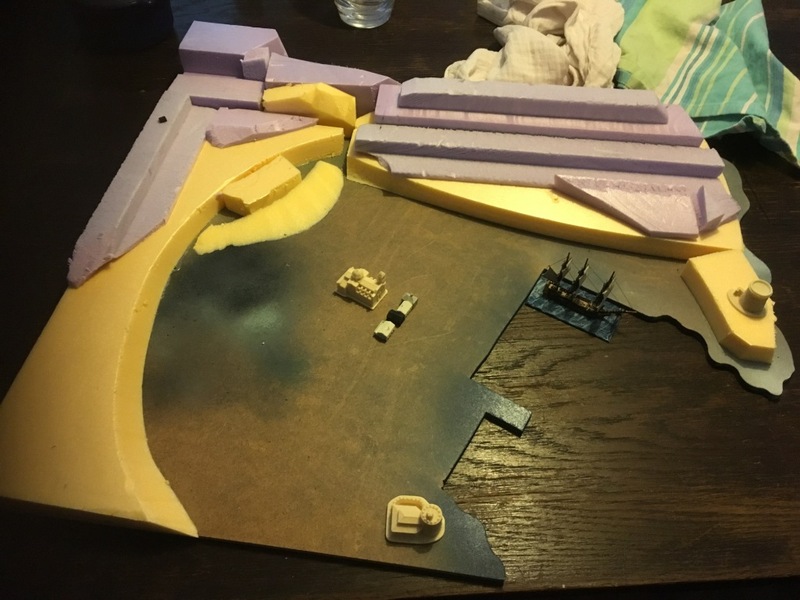 On the main island the shape of the harbour was cut straight into the mdf. A quick test with one of my ships of the line showed that the scale is quite okay. 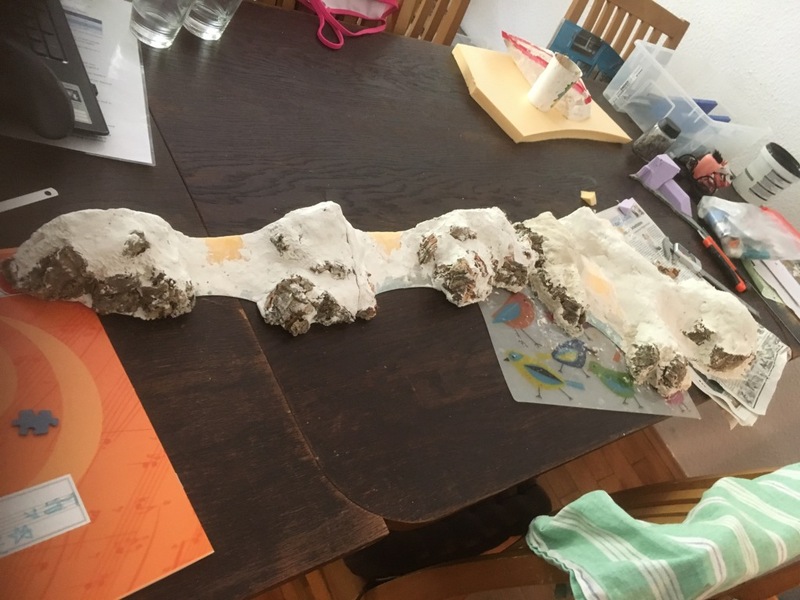 The coastline grew longer and longer as I used bag after bag of the papier maché. 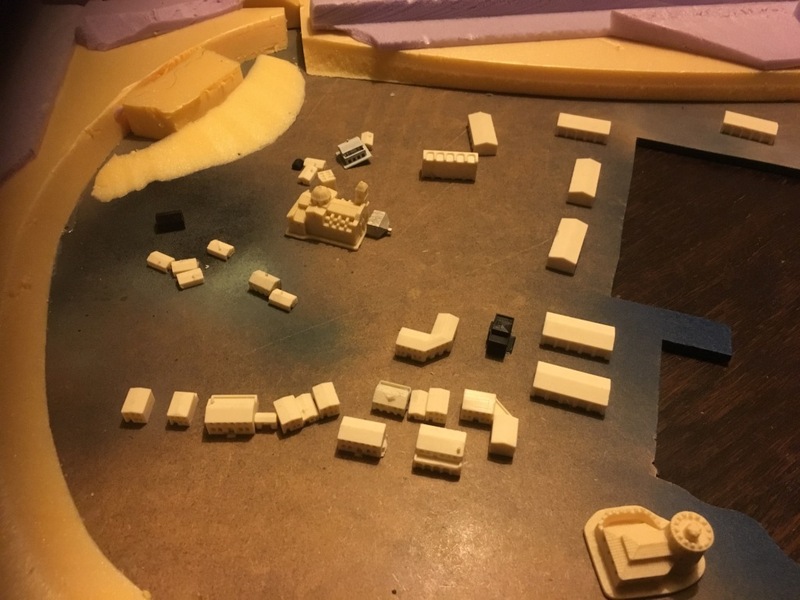 Meanwhile I had to focus on constructing the buildings. 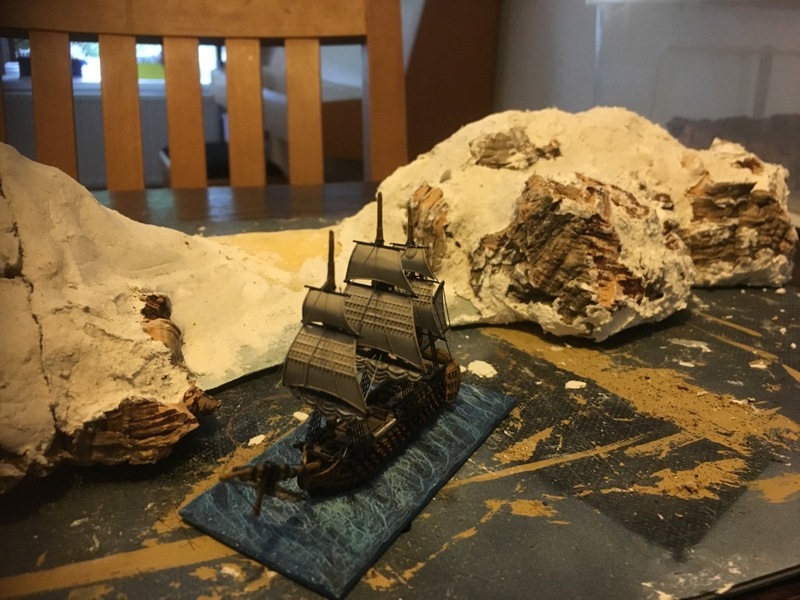 I had bought some models from Redcoats ModelJShip shop, who has wonderful buildings in 1:1200. 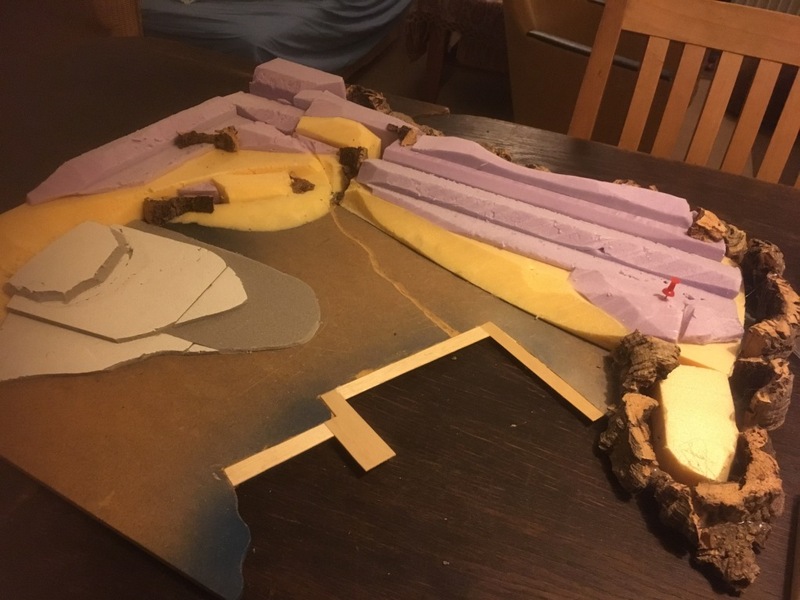 But the buildings didn’t fit all into the Caribbean setting, in the end I used the cathedral, the tower and a harbour tower building from his collection. For the rest I used a different approach. 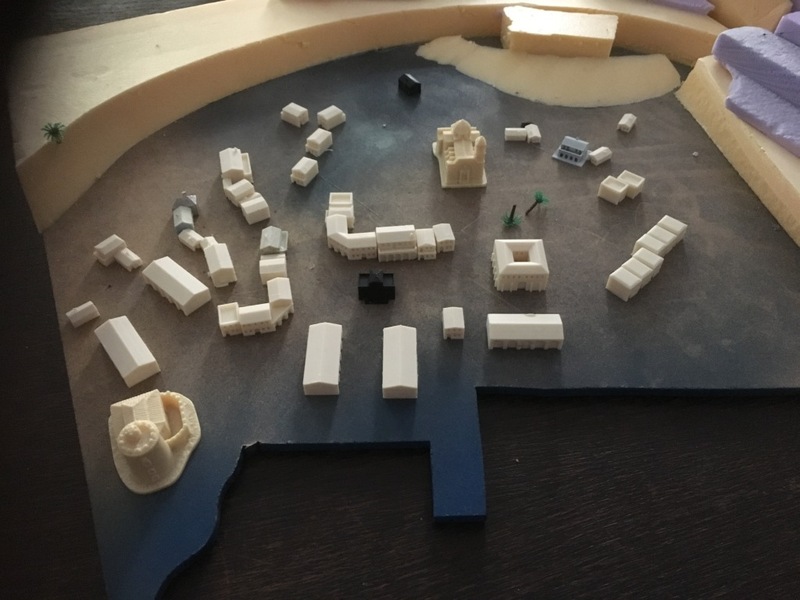 I started used google sketchup to construct some basic buildings which could be printed several times. My digital design skills are very basic, but in this small scale it’s just about geometrical shapes and not about having a detailed texture on a surface (which I’m not capable to design). This was one of my first prints. To give the town a little extra, I constructed a hillock to put the cathedral on it. This should be the centrepiece of the town. 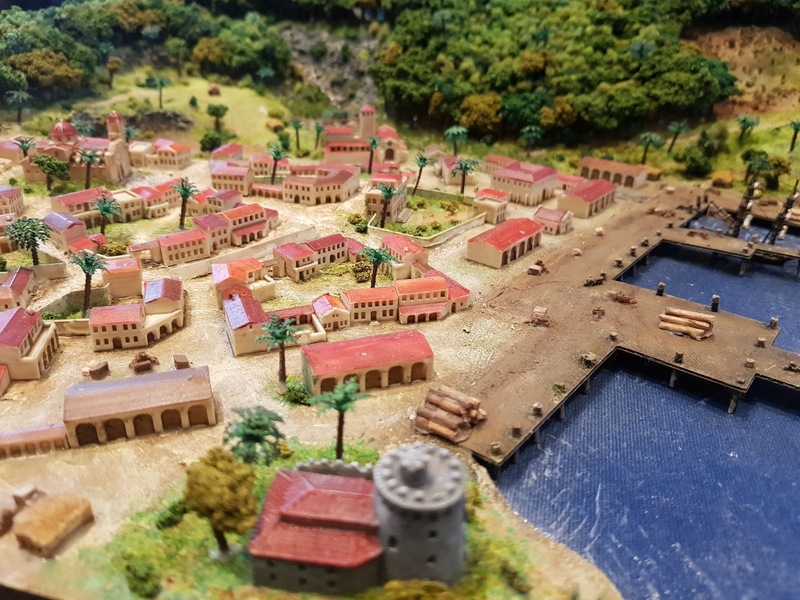 A small stream was carved at one side of the town and the waterfront was built with thin balsawood. 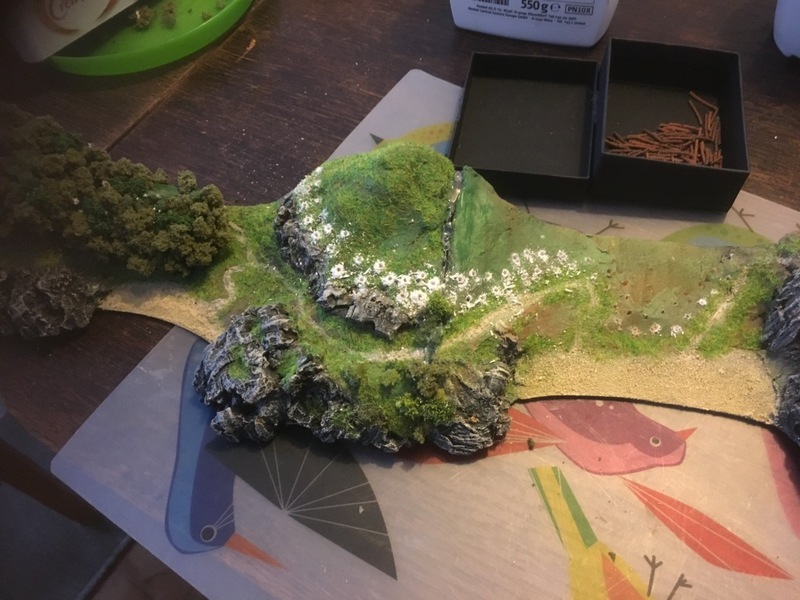 Then the same papier maché mass was applied to all the different hillsides and the basic shape of the landscape was finished. Thanks Bligh, the Brigade Models I hadn't on my wishlist so I will take a look for their models. 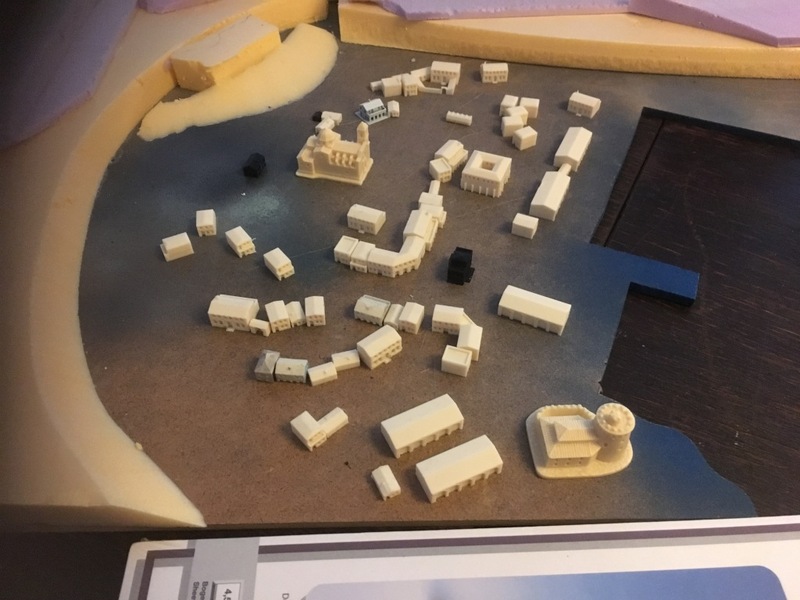 Here are the final pictures of the production process as well as the final pictures of the game on the Tactica. So let's get to the jungle. I planned to plant two rows of tree trunks on the edge of the woods and cover the inner area of the forest just with the canopy. 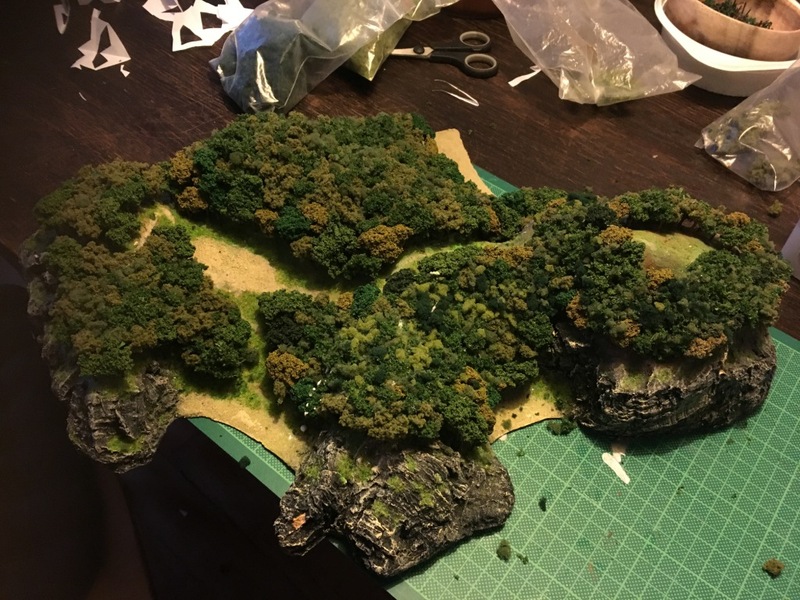 Therefore I started to construct a underlying base for the canopy which had the shape of the terrain. 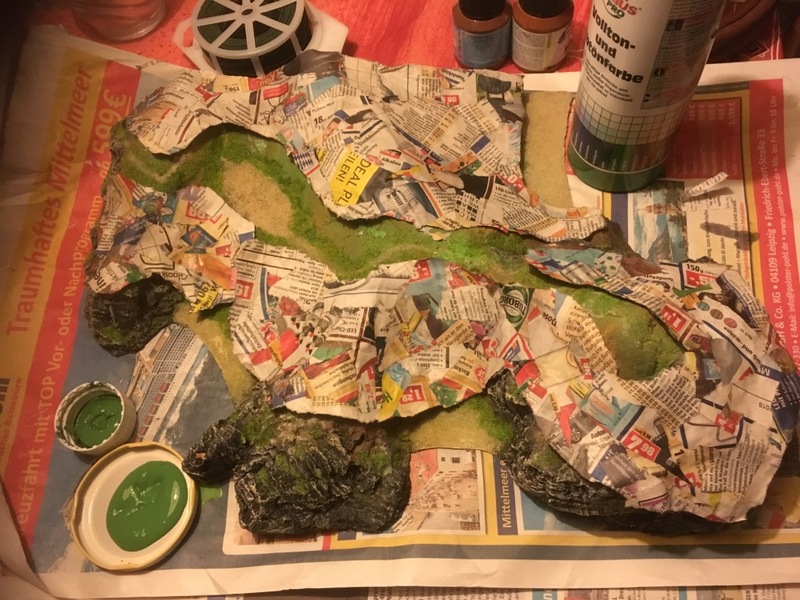 I used paper mache out of an old newspaper, as it is light and flexible. 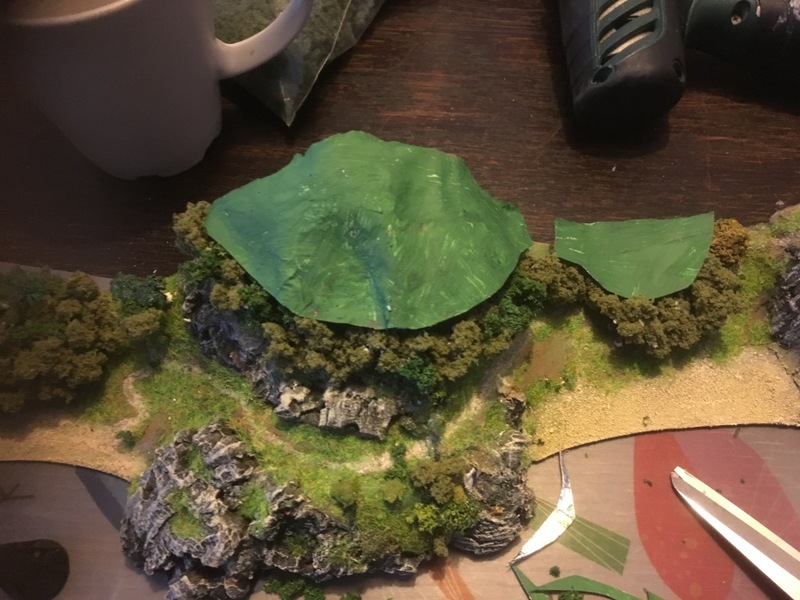 Then the tree trunks were glued into place and on top of the trunks different forms of foliage glued into place. 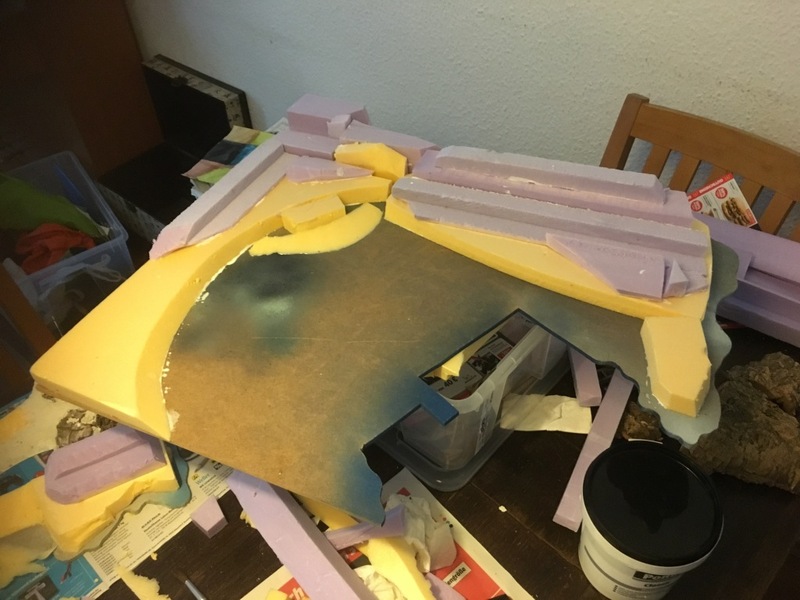 After the whole thing dried the base for the canopy was glued into place. 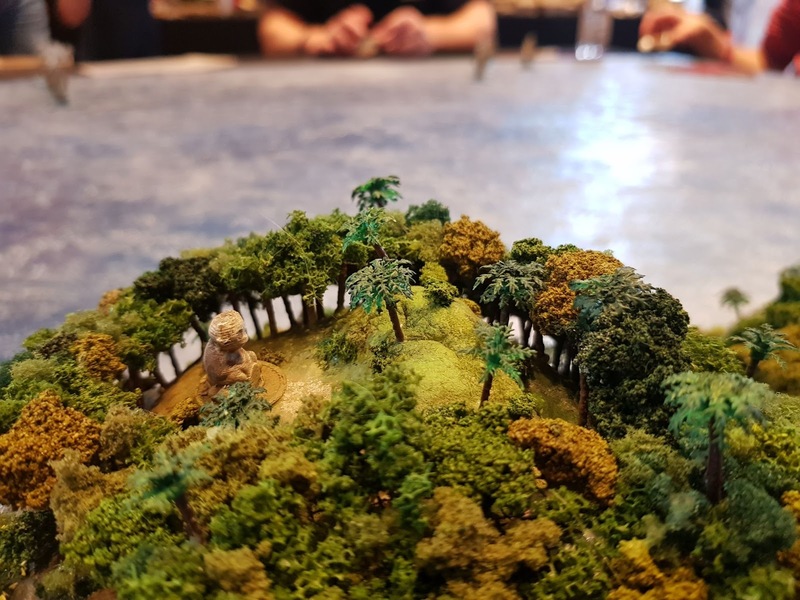 At this point the forest looked more like a mixed forest of a moderate climate zone, so I had to add some jungle elements. 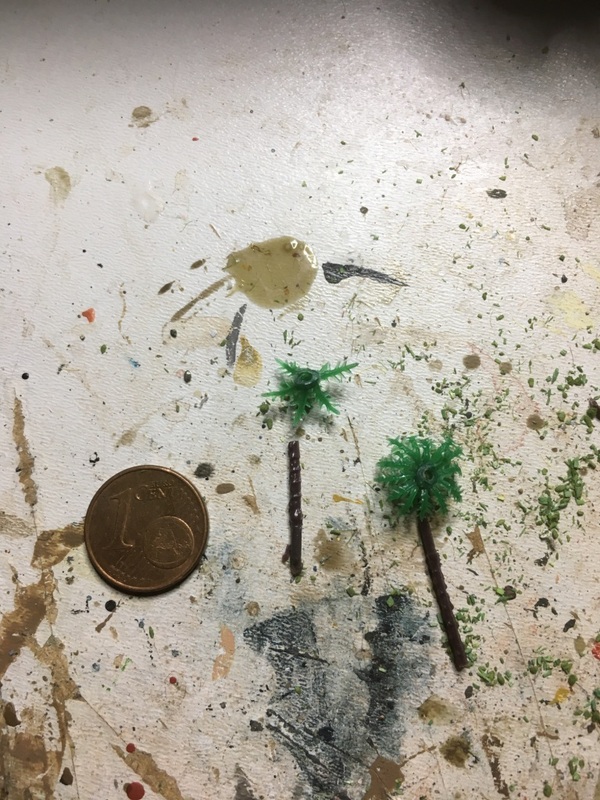 The smallest miniature palms I could grab on ebay where 30mm tall, which is to tall for this scale. The treetop of the palm was very tall as well. So I just cut the palm trunks into two halves and the treetops as well. I glued them into place again and had twice as many palms as I had before! 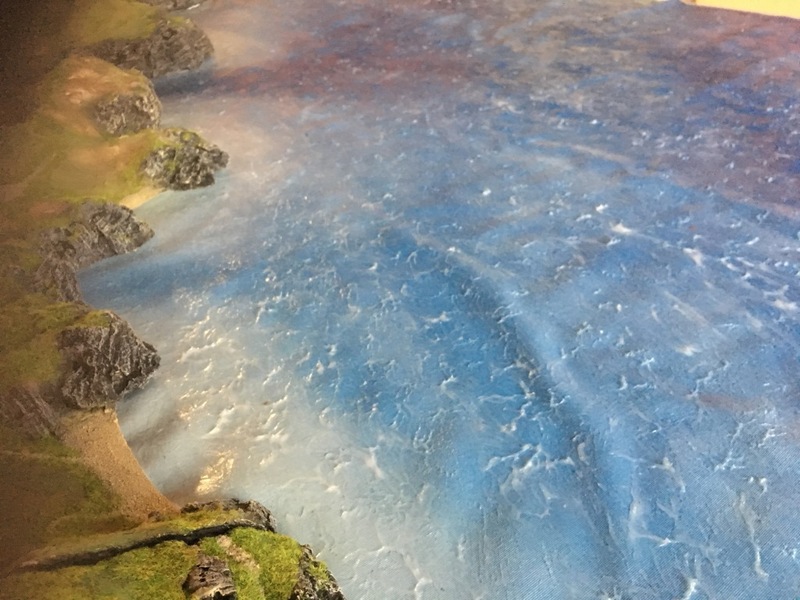 The overall result is very pleasing, here are some of the pictures with the terrain on the seascape mat. 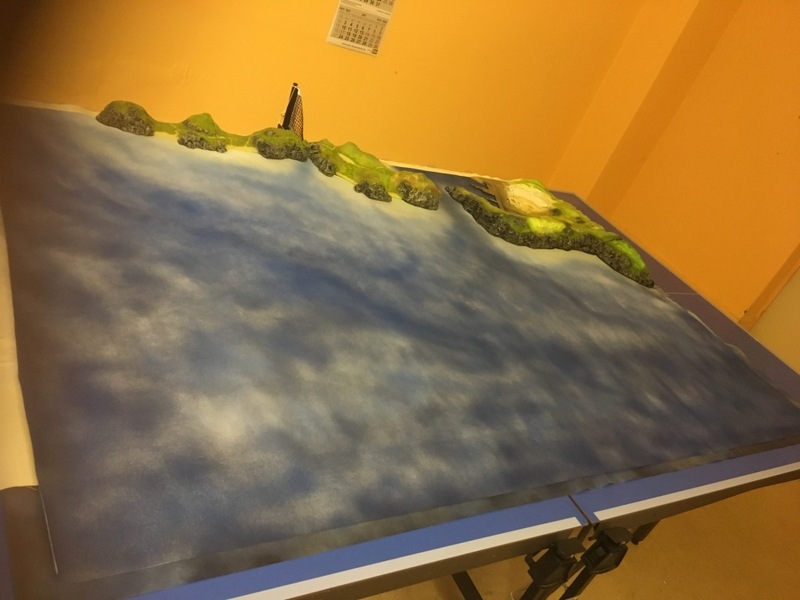 Here are pictures of the final table on the Hamburger Tactica. Thanks to thrifles who took the pictures. Well Alex you have indeed excelled yourself, and gained a medal upgrade into the bargain. 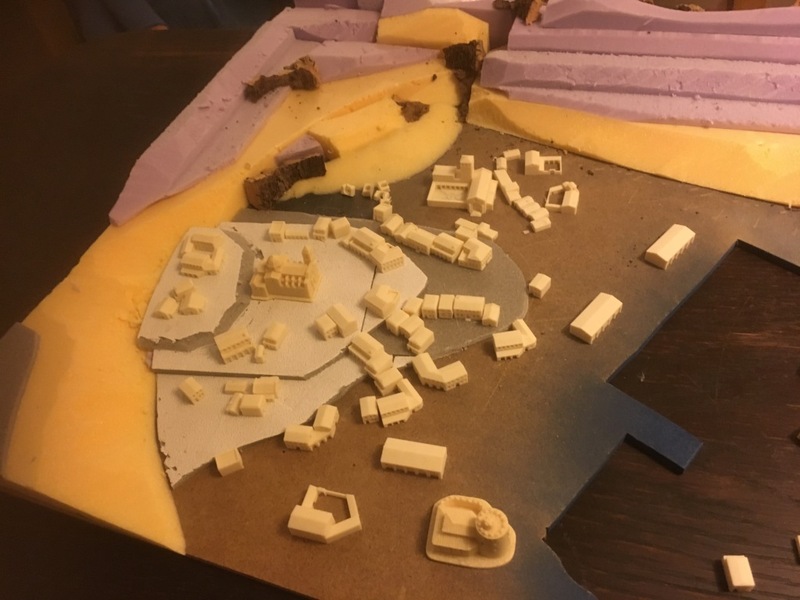 This is a magnificent piece of modeling, and the buildings you have produced really something for us to covert for our own landscapes. I have converted the whole into a "How To" which is the reason for your bronze star on your medal. Also Rep is heading your way. Well done and here is to the next piece of your work to be published. Hi Alex, you have done an exquisite work. I really love the realistic appearance of the coastline and the town. I hope to reach a good agreement with the negotiations of the buildings. We all covert those extra buildings. Do you think that Alex would consider a deal? 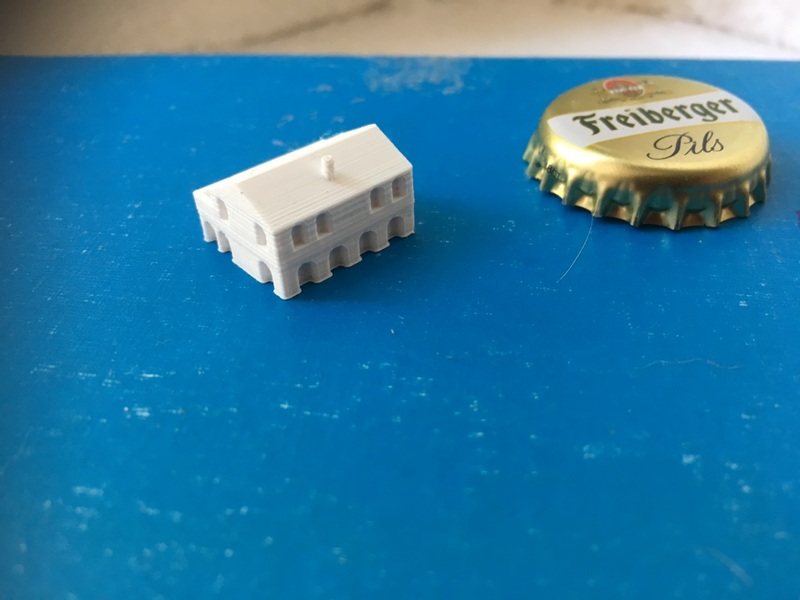 I have proposed him print them in 3D for me and I am going to texture the walls and the roofs. 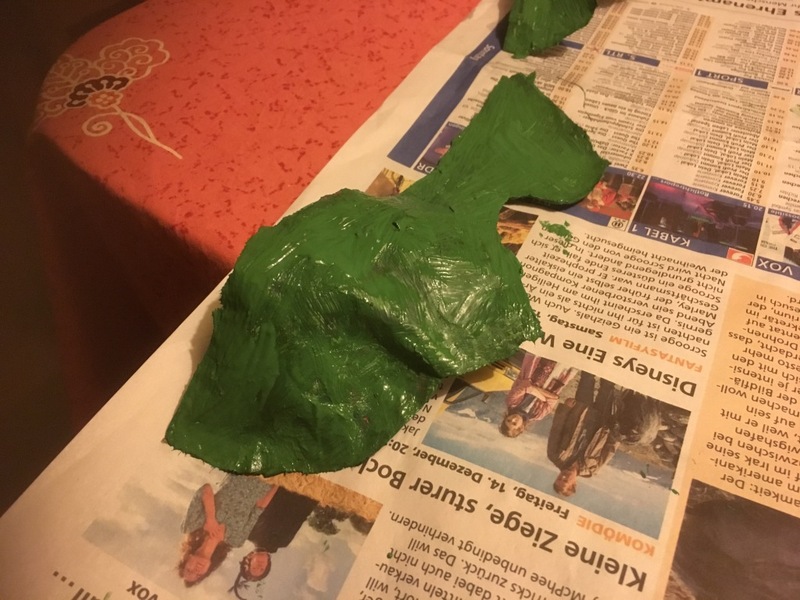 The idea is then to make some molds in silicone and clone them in resin. But everything depends if he wants. I will keep my fingers crossed then. Spanish is certainly the area where we are short of buildings, and considering the influence they had all over the world in the Spanish colonies it is a shortcoming which really needs addressing Julián. I was just reflecting on why neither Langton, or brigade has a dedicated line of Spanish instead of just a random church or so on. It will be a great loss for naval gaming when they don't have the energy anymore to keep the business going. Yes, I'm afraid so. Even if there is someone who continues with his business, I do not think is dedicated to make more boat ranges. Somehow we forget that we are all getting older. I cannot remember a time when there were not the Langtons. Gradually the great modelling names of the past are all disappearing. I do not know to what extent Langton could transfer the business to another person once the time comes.